Saturday, July 13th in Forni Avoltri the presentation will take place of the photographic exhibition “Gino Del Fabbro: a photographer, a territory, a community”, organized by the Municipality of Forni Avoltri in cooperation with the Province of Udine, the Comunità Montana of Carnia and the Circolo Culturale Fotografico Carnico - the Carnian Cultural Photographic Association. Gino Del Fabbro, born in Pierabech, after an apprenticeship with the Comeglians photographer Umberto Candoni, established his own business in 1951 based in Forni Avoltri. Del Fabbro also worked for Goccia di Carnia and among the shots on show you can also admire the photos of the truly historic moment in the company’s history with the inauguration of the plant at Pierabech. 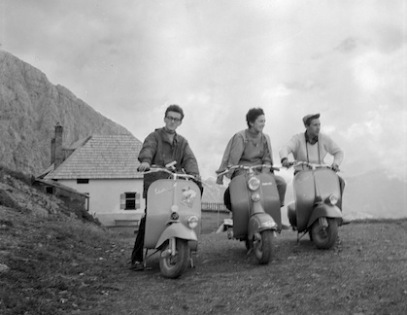 In addition to his famous and lyrical alpine views, in fact, there stands an entire body of work of priceless historical and social value that recounts community life in Forni Avoltri and Carnia. Through his lenses are celebrated the traditions, religious holidays, leisure time and rites of passage, describing urban change, tourist accommodation facilities and recreational activities including public and industrial commissions, alternating black and white images with colour photographs that cover the period from the 1950s through to the early 1980s. It is on these aspects of Del Fabbro’s work, less well-known but highly significant, that the two curators of the exhibition, Elisa Bertaglia and Stefano Perulli, have chosen to focus. The exhibition is part of a wider project involving the reorganization, digitization and cataloguing of the entire photography archive that the Town Council hopes, with the support of public and private sponsors, to be able to continue in the near future. Part of the archive is in fact already catalogued and available online through SIRPAC - the Regional Information System of Cultural Heritage, managed by the Regional Centre of cataloguing and restoration based at Villa Manin di Passariano. The exhibition is open until 31st August, 17 - 18.30 and 20.30 – 22 Tuesday to Saturday, 10 – 12 and 16:30 - 18:30 on Sundays - Closed on Mondays.